eSpace is an elegant and technologically advanced furniture system that lets you define—and redefine—every square foot of your office environment. With eSpace, you can create private, semiprivate, and highly interactive work areas in free-standing and panel-mounted configurations that meet virtually every tasking challenge. Ideal for any functional area—from reception to executive suites—eSpace enables inspiring and integrated environments that help maximize information flow and office productivity. With eSpace, high-quality materials are a standard choice, not an add-on option. Clean aesthetics and simple lines let you attain the next level of visual appeal. 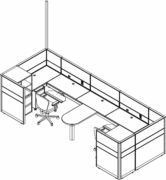 Standard panel-hung and optional freestanding work surfaces are available in a variety of sizes and shapes: rectangular, curved, D- and P-shaped corners with curvilinear ends or height adjustable keyboard cut-out. Choices including overheads, open shelves, pedestals, and lateral files mean storage is never a problem with eSpace. Overhead door fronts can be powder-coated or fabric-covered. Glazed sliding doors available in 67” and 82” heights for partial privacy. In an eSpace environment, panels do much more than define the work space—they provide a structural foundation for hang-on components, house electrical and data wires, and elevate the aesthetic profile of any space. Offered in a variety of heights, widths, and surface treatments, eSpace panels also support work surfaces and storage units, mounted in 1-inch vertical and horizontal increments for optimal user comfort, and better ergonomics. eSpace is manufactured using clean technologies and materials, including water-based adhesives and powder coating that are virtually VOC-free. 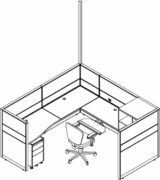 The eSpace system can be custom ordered to meet the needs of even the most demanding office environments. 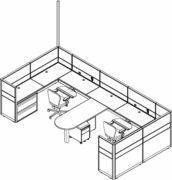 Our design and manufacturing professionals will be happy to help you build the eSpace solution that takes your work place to new levels of functionality, efficiency, and style. Contact us today about transforming your office space with eSpace. We stand by our products! All CORCAN furniture lines are backed by a 10-year warranty against defects in materials and workmanship. Fabric, mechanical, and electrical parts are warranted for a period of five years.